Click Here To Secure Your Completely Automatic Football Betting Picks! The first week of the NFL season is always the most difficult to predict, as little is seen of starting teams during the preseason. There are methods to use, however, including point spreads, overall team trends, head-to-head match up, previous season’s performance and so on. Utilizing the Power Ranking Indicator, Team Strength Oscillator, Head-to-Head records from last season, among others, here is my breakdown for six games this week. Jacksonville finished 3-13 last season, while Houston finished on top of the division at 9-7. The Texans come in as a 5.5 point favorite and won both meetings between the teams last season. Houston holds the advantage in terms of Power Ranking Indicator at +19 and climbing to +10. Similarly there is a wide margin in terms of NFL Team Strength Oscillator with this Texas at +8.44 compared to the Jaguars at a woeful -16.28. Everything in the tools points towards a decisive victory for the Texans in this one. In a battle in what is likely to be a tight NFC East, the Eagles come in as a slim one point favorite. Interestingly enough, the Redskins took both meetings last season, as a favorite at home and as the underdog in Philadelphia. The Power Ranking Indicator gives a wide advantage to the Eagles at +25 and rapidly rising, while the Redskins are at +4. This is likely because the Eagles have added weapons in the off season and the high expectations of quarterback Carson Wentz. The NFL Team Strength Oscillator shows the Redskins with a slight overall advantage at +4.82 to +1.09. Currently the Eagles appear to be the stronger team, however, and I see the Eagles edging the Redskins by at most a field goal. The Colts were 8-8 last season, while the Rams were a dismal 4-12. The two teams haven’t met since preseason in 2015, so head-to-head results don’t come into play. Interestingly the Rams are a 3.5 point favorite and hold a slim +16 to +15 advantage in the Power Ranking Indicator. Looking more closely, though, the Rams are on the decline in that Indicator, while the Colts are rapidly rising. The trend continues with the NFL Team Strength Oscillator with the Colts holding a +4.22 to -4.37 advantage with the gap increasing. Even without quarterback Andrew Luck, take the Colts in this one, despite the underdog status. This is one of the best match ups of the week with the Packers coming in as 3.5 point home favorites. Last season, the Packers won as a home underdog and the teams finished with nearly identical records, at 10-5-1 for the Seahawks and 10-6 for the Packers. Seattle holds a slight edge in the Team Strength Oscillator, but a most decided edge of +28 to +22 in the Power Ranking Indicator. What makes this a tough pick is the Seahawks were a mediocre 3-4-1 on the road, while the Packers were 6-2 at home. It’s difficult to pick against Aaron Rodgers at home, so I hesitantly pick the Packers to open up at 1-0. The last meeting between these two teams was September 2014 where the Saints won as the favorite. However, this plays little in determining the pick between two teams that were nearly even in win-loss record last season. The Vikings hold the clear advantage in both the Power Ranking Indicator (+20 to +2) and Team Strength Oscillator (+3.98 to -5.13). They are also 3.5 point favorites at home. While tempted to pick Drew Brees and the Saints, all signs point towards the Vikings in the opening. The Chargers finished 5-11 last season compared to 9-7 for the Broncos, however the teams finished 1-1 head-to-head. 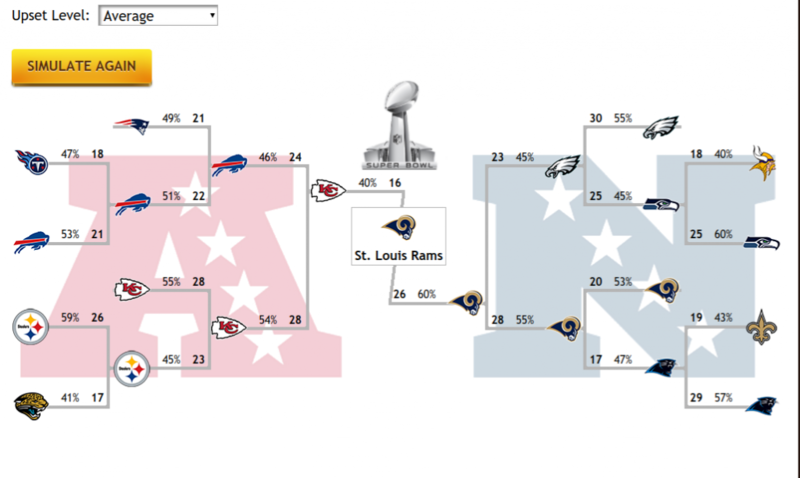 Denver won as the favorite and the Chargers won at home at the underdog. The Chargers are at +23 according to the Power Ranking Indicator, which is strong for a team that finished last a season ago. However, the Broncos are quite stronger at +31 and also hold a nearly 27 point advantage and increasing according to the Team Strength Oscillator. It would be a great story for the Chargers to win their first regular season game as the Los Angeles Chargers, but that’s unlikely. I pick the Broncos by a wide margin in this one. Nerdy Football Analysis: Mother nature wins again. Moving the game to Pittsburgh or Philadelphia was discussed but in the end, fantasy owners of Jay Cutler, Jay Ajayi, Jameis Winston, Mike Evans, etc need to find other options.